Direct from the Detroit Autorama, see all the cars and hear the interviews from all GREAT 8 finalists in the hunt for the famed RIDLER AWARD. Produced in full HD by Two-Lane Blacktop Productions. Teaser video of the Great 8 finalists. WHO WILL WIN THE RIDLER AWARD SUNDAY EVENING? Thanks to Cobo Joe's Smokehouse BBQ and Sports Bar for sponsoring this Behind the Scenes look at the cars and work involved in preparing for the 2016 Detroit Autorama. Show opens Friday February 26...runs through Sunday. Video produced by Two-Lane Blacktop Productions. Ride along with Two-Lane Blacktop Productions as we capture the 2015 Woodward cruise from all perspectives. Aerial shots, driving footage and some great interviews tell the story. Thanks to our sponsors including Eaton Detroit Spring, National Parts Depot and United CNC Machining. Two-Lane Blacktop Productions gets the full story behind the Great 8 and Chip Foose and his IMPOSTER 1965 Chevrolet Impala Ridler winner. Full HD presentation capturing the essence of these incredible cars and the very prestigious awards they earned. Two-Lane Blacktop Productions were once again the exclusive video crew to capture some fantastic car history being made as Chip Foose wins his 4th RIDLER AWARD with his 1965 IMPOSTER Chevrolet Impala owned by Don and Elma Voth. Full AUTORAMA episodes coming soon. Huge thanks to Cobo Joe's Smokehouse BBQ for sponsoring this behind the scenes video from the Detroit Autorama. Two Lane Blacktop Productions captures the action on Woodward 2014. Special thanks to our sponsor Pilot Transport. Sponsored by NPD and the FAST organization, Two-Lane Blacktop Productions covered the action in this June 2014 Factory Appearing Stock Tire Spring event. The racing took place at the US131 Motorsports Park race track in Martin, MI. The full episode is coming soon to an electronic device near you. Produced by Two-Lane Blacktop Productions. Two-Lane Blacktop Productions gets the full story behind the Great 8 and Ridler winning cars. Full HD presentation capturing the essence of these incredible cars and the very prestigious awards they earned. Two-Lane Blacktop Productions interviews one of the top custom builders in the world, Troy Trepanier is named Featured Builder of the 2014 Autorama. Interviews also include legendary custom builder Gene Winfield. Gene is chopping the top on a '61 Ford Starliner in Cobo's basement. Two-Lane Blacktop Productions was behind the scenes as the custom cars and hot rods were rolling into the Cobo Center for the 2014 Autorama. Hear the cars, hear the stories. More videos coming soon including the Great 8 & Ridler stories. 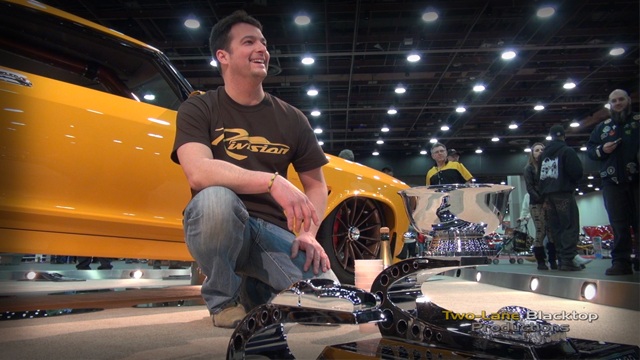 Two-Lane Blacktop Production's EXCLUSIVE FOOTAGE OF THE 2014 Detroit Autorama Ridler winner. JF Launier wins the most sought after custom car award following 2 previous Great 8 wins. JF knew exactly what he needed to design and build to win the 2014 Ridler. Congrats to JF and the entire crew at JF Kustoms !! Two-Lane Blacktop Productions once again covers the complete Great 8 and Ridler winners in this full episode HD video. Direct from the Motor City Capital Detroit at the 61st Autorama. This year the Autorama is celebrating the 50th year anniversary of the Ridler Award. Originally won in 1964 by Al Bergler with his Bantam coupe dragster. Great interviews before and after the Ridler presentation. Also, exclusive Chip Foose commentary included. Special thanks to this year's sponosrs Eaton Detroit Spring and Pirelli Tire. Detroit hosted the return of Grand Prix racing to Belle Isle this year. Hear interviews from Dale Coyne, team owner...see the cars, and take a full lap ride around the race course via and in-car camera. Behind the scenes look at some of the cars, drivers and other cool footage of some of the racing on Belle Isle in Detroit. Check out the cool cars, trucks, and unique vehicles that were on display this year at the Detroit AutoRama. Listen to the Backyard WrenchHEADS as they tell the stories of their builds. Fun music, great camera shots all produced by Two-Lane Blacktop Productions. See all of the fabulous GREAT 8 Winners from the 2012 Detroit Autorama. Beautiful cars, great interviews, including the exclusive Backyard WrenchHEADS TV Ridler Winner Dwayne Peace interview. Produced by Two-lane Blacktop Productions, LLC. Cool behind the scenes footage of the setup process at the COBO Center in Detroit for the 60th Annual Autorama. Also see the action in the basement level where you will find a wide variety of hot rods, rat rods, traditional rods, pinup girls and more. Produced by Two-Lane Blacktop Productions, LLC in High Definition. More 2012 Autorama cverage coming soon!! Dwayne Peace wins the 2012 Ridler Award at the Detroit Autorama. Watch this quick teaser to see this incredible 1955 Thunderbird. Full episodes of the 2012 Detroit Autorama are coming soon. Produced by Two-Lane Blacktop Productions, LLC. Cobo Joe's Sports Bar & Grill presents this cool behind the scenes look at soe of the action that goes into setting up the Detroit Autorama. Filmed inside Cobo Center by Two-Lane Blacktop Productions. Sponsored by DISCOUNT TIRE and produced by TWO-LANE BLACKTOP PRODUCTIONS, this video reel of the 2012 Detroit AUTO SHOW highlights some of the coolest cars at the show. What is your favotite car of the NAIAS? POST YOUR COMMENTS HERE! Murray Pfaff designed and built the incredible 1959 Imperial Speedster. While in Las Vegas for the 2011 SEMA show, this video shoot captures some great driving footage of this radical custom with the backdrop of the Red Rock Canyon. See the Great 8 finalists' amazing cars and hear their comments leading up to the presentation of the prestigious Ridler Award. Classics, hot rods, customs, model cars, rat rods and pinup girls. See just what makes the Detroit Autorama such an incredible annual event. Our cameras were rolling to capture the show's prep work, along with a timelapse, interviews, and hot rods rumbling through Cobo Hall! More great coverage from the 2011 Detroit Autorama, including some very cool custom home-built rides, brought to you by Summit Racing. Check out Ed Micol's super straight tuxedo black 56 Chevy convertible - from every angle! Check out some of the best highlights from the 2011 North American International Auto Show! BwH TV brings you the highlights of the 2010 Detroit Autorama in this supercharged video sponsored by Eaton Detroit Spring. 2009 SEMA Show - ShBoom Goes to Vegas! Mickey Thompson Tire Company sponsors this hot new video of Bob's 1200 HP Cadillac cruising down the VEGAS STRIP. Hear the story from inside the show. Take a stroll through Cobo Center in Detroit for the 2009 North American International Auto Show. See the cars, models, and more!